There are several examples of this negative correlation. Gold stocks soared from 1973-1974 when the S&P 500 was cut in half. The same thing happened from 2000 to 2002. 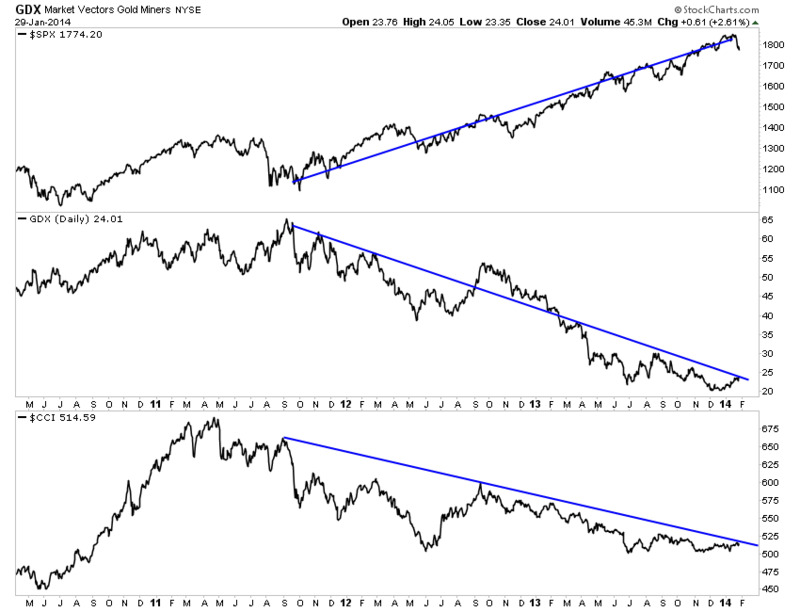 Also, gold stocks for over 18 months in 1977-1978 began a new cyclical bull market while the S&P 500 declined 19%. This scenario has happened three times: twice in the last bull market and once in the current bull market. Recent market action suggests that this negative correlation will continue but in favor of precious metals and also hard assets. In the chart below we plot the S&P 500, GDX and CCI (commodities). Since the end of summer in 2011 there has been a clear negative correlation between equities and gold stocks as well as equities and commodities. The tide appears to be shifting as today GDX closed at a two-month high while the S&P 500 closed at a two-month low. A few days ago, CCI closed at a two and a half month high. This price action shouldn’t come as a surprise as global markets and asset classes are ripe for a shift. The bull market in the S&P is already quite mature while hard assets have been in a cyclical bear for nearly three years. Sentiment on equities (according to the Merrill Lynch fund manager survey, Investors Intelligence or NAAIM data) has been extremely bullish and in some cases even more so than in 2007. Meanwhile, sentiment on bonds (which are also rallying), commodities and precious metals has been extremely bearish since last summer making these markets ripe for a strong reversal. 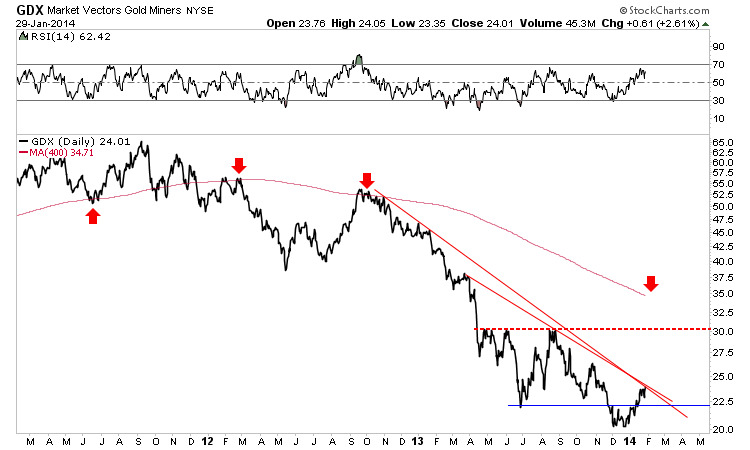 Conventional thinking could lead you to believe that equity weakness would be a negative for precious metals. While that was the case in 2008, the negative correlation from 2011-2013 and recent price action suggest precious metals (and gold stocks in particular) will benefit from a bear market in equities. Gold stocks have already endured a multi-year bear market. Large-caps shed 65% while juniors lost 80%. Everyone has already sold out of precious metals and piled into US and developed market equities. However, we are seeing signs that the trend is shifting. Over the past month GDX is up 18% and GDXJ is up 27%. As long as the 50-day moving averages hold, we expect continued gains in the coming weeks and months.